EHRs and health information exchanges provide a foundation for actionable data analytics to contain costs and improve care. The development, growth, and ultimate success of accountable care organizations (ACOs) hinges largely on the extent to which they gather, share, and analyze data to achieve optimal patient care, efficient workflows, and reduced costs. Whether you’re looking at an ACO serving patients within a tightly circumscribed radius or a statewide population, this is no small undertaking. Scalable in nature, emerging IT solutions designed to satisfy these objectives are growing more sophisticated as vendors respond to a rapidly expanding market demand. The key components required to address these concerns come down to effective data management through the use of EHRs, health information exchanges (HIEs), and data analytics tending toward modified workflows. The expendable resources necessary to make this happen depend largely on an ACO’s scope, clinical needs, and existing technology. It’s worth taking a moment to review the current landscape, not only in terms of IT solutions tailored to promote ACO development and progress, but also where there may be gaps in this key component of healthcare reform. ACOs are set up to coordinate care and manage costs for a defined population across disparate settings, including physician offices, physician groups, pharmacies, hospitals, and post-acute care environments. As originally defined by the Centers for Medicare & Medicaid Services (CMS), ACOs initially operated as groups of providers contracted to serve a distinct subset of Medicare patients, often within a circumscribed region. The concept emerged in the face of rapidly escalating Medicare costs with the aim of gaining efficiencies so that the CMS and affiliated providers might benefit from the resultant shared savings. “It’s really a response to controlling the increased costs of Medicare services,” explains John Stanley, principal of Impact Advisors in Seattle. It wasn’t long before commercial payers recognized the clinical and financial advantages of coordinating care across a wide swath of patient care settings. “The real market is well beyond the strict Medicare definition, where organizations, large hospital systems, integrated delivery networks, and many physician groups are looking at accountable care programs as sponsored by state initiatives, commercial payers, and other [resources],” Stanley says. While the payer mix has expanded, an ACO’s fundamental mission remains the same: to contain or reduce costs while establishing efficient workflows and sharing information among disparate providers for improved patient care. 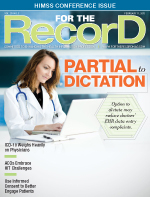 Numerous ACOs have taken the first step in this initiative by implementing EHR systems to collect historical and patient care data in a manner conducive to distributing this information among providers and payers. The CMS has promoted the meaningful use of EHRs through incentives and potential penalties depending on a provider’s compliance with standards initially stemming from the ARRA. Those standards and associated timelines evolve with each passing year. “Meaningful use is driving the adoption and the certification mechanism and the will to make vendors of electronic medical record software adopt these standards so that the EMR that the provider uses can [support] an integrated workflow,” says Colin Barry, CEO of MEDfx, an integration vendor. EHRs are a foundational component necessary to collect actionable clinical content in an efficient manner. The next step is sharing that content among a broad range of stakeholders. HIEs can be thought of as the connective tissue that links an ACO’s providers and payer partners by disseminating pertinent data at the point of care with the ultimate aim of integrating clinical workflows. Previously, providers faced an expensive and onerous task to match up fields and other data elements among separate localized settings. This made it difficult to share timely information in a standard format, almost as if different care environments conveyed data in a language all their own, unintelligible to others. HIEs allow organizations to leverage existing assets such as EHRs and data analytics dashboards, ideally linking them in a seamless connection. Such connections are forged not only among different providers within an ACO but also among providers and payers. “That’s a central piece of [an HIE’s] value proposition,” says Jeff Petry, vice president of strategic initiatives at Premier Health Care Alliance. Provider-payer connectivity plays an increasingly important role as a wider mix of payers partner with ACOs. Petry envisions multiple stakeholders as a series of concentric echelons supporting an ACO’s objectives. In the absence of keen analysis, the value of sophisticated technology used to gather and share clinical data is limited with regard to its effectiveness in creating more efficient patient care workflows. Data analytics aimed at spotting inefficiencies and suggesting avenues of improvement promote cost containment and improved delivery of care across a gamut of provider settings—precisely the objectives ACOs were established to achieve. Effective use of data analytics provides an invaluable mechanism by which an ACO can “change the equation,” according to Stanley, adding that the technology can bring about operational efficiencies while improving—or at least maintaining—the quality of patient care. “How do you change the equation? Ultimately, it comes down to workflow. It’s based upon getting data and analyzing data to change the workflow and gain the results that I’m looking for in cost or quality,” he explains. Operational efficiencies and cost containment may appear to be the most obvious benefits of effective data analytics. However, that would be ignoring its effects on patient care. Stanley says that in settings where data analytics drive workflow upgrades, the evidence indicates patient care may likewise improve. “That’s where the integrated networks like Kaiser and all the others have been able to demonstrate the same or better quality at a lower cost,” he says, noting that cost savings need not compromise the quality of patient care. The effective use of EHR technology, HIEs, and data analytics will prove essential to the further development and success of any ACO initiatives. Many ACOs have made strides in improving outcomes both in terms of cost savings and patient care. For others, however, technology gaps are preventing them from achieving the desired results. As healthcare reform continues to evolve, considerable resources are being invested in attempts to bridge such chasms within ACOs. — Robert J. Murphy is a freelance medical journalist in Philadelphia.